Time for a chicken recipe! Seeing as you know me for so long, you'd know that in my pre-married life, I did not cook. I baked. And looked fancy-a** dishes on Pinterest and tried to make them. But regular daily food? Nevah. 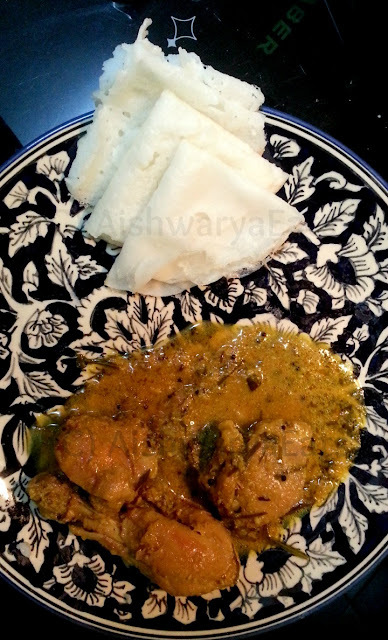 One of the things I did cook though, was a Chicken Kuzhambu. 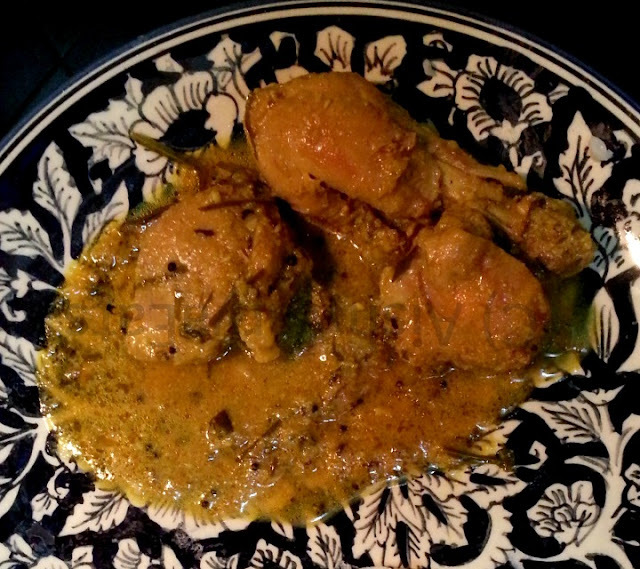 A gloriously coconutty gravy, embellished with the homey flavour of curry leaves, texture from the poppy seeds, and tender, melt-in-the-mouth chicken. It takes a little time, and the list of ingredients is frighteningly long but its very very worth it! So here's the recipe for Chicken Kuzhambu. Many readers requested an accompaniment to the Neer Dosa recipe I put up last week, and this is it! 10-12 curry leaves. Get the larger older leaves, they have more flavour. Okay first wash the chicken very well and marinate in salt, turmeric and chilli powder (over and above what I've mentioned). Grind the ingredients I've mentioned in "For grinding", with a tiny bit water to make a thick smooth paste. In a pressure cooker, heat oil. When hot, add the "For tempering" ingredients one by one, then add the curry leaves and green chillies. Add the onions next and saute it. Add the ginger garlic paste and fry till the weird raw smell is gone. Tip in the tomatoes and fry till mushy. Add the turmeric powder, chilli powder and coriander powder. Stir to combine, then add the chicken. Stir well so that the masala coats the chicken well. Fry for 3-4 minutes. Now add the wet ground masala and stir well. Now add hot water, a little less than how much you want the gravy, because the chicken is going to release moisture. Add the salt (and sugar, if you think it needs it). Now add the lemon leaves or lemongrass stalks, if you have them. Else, Just add the mint leaves, coriander leaves and pressure cook this for 4-5 whistles. Let the pressure calm down, then pour into a serving bowl and serve with rice, or neer dosa. It goes wonderfully well with the soft dosa, or even basic steamed rice. 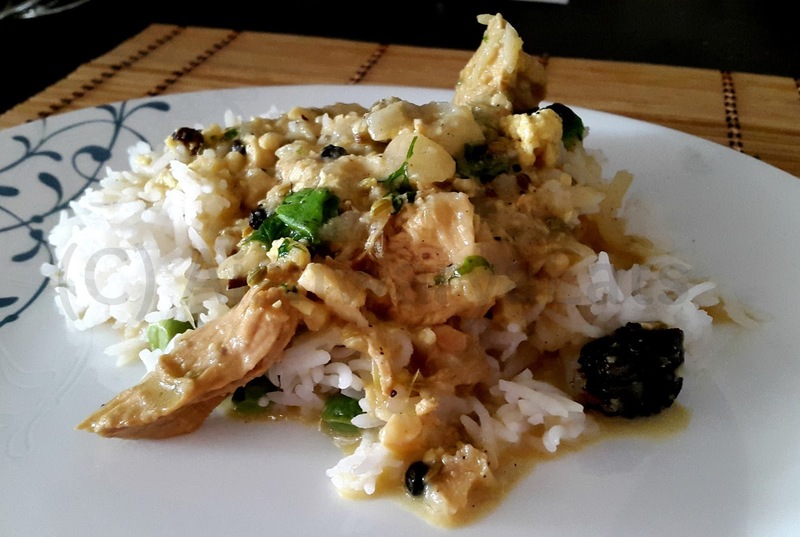 The lemon leaves or lemongrass stalks add a different profile of flavour and aroma to the dish, and elevates this from being just a chicken dish. I made it with boneless chicken as well, and it's just as delicious.